Safe Working Load: 1100 lb. Ronstan Ball Bearing Orbit Blocks™ boast the highest strength-to-weight ratio available. This is achieved through all-composite reinforced polymer materials and a Dyneema® rope link head. Their precision design allows the optimum number of ball bearings in loaded areas and eliminates them in inactive areas. 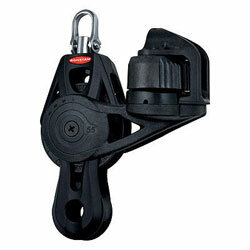 Ineffective mass is reduced even further through fiber-reinforced composites in the block head, cleat arms and beckets. Max. Working Load: 1100 lbs. Note: Fiddle sheave has a high load full contact bearing (ie. not ball bearing). Main sheave has two-stage, ball bearing.